Place potatoes in a large pot of generously salted water. Simmer until potatoes are tender. Drain and allow to rest until cool enough to handle. Peel potatoes and cut into 1-inch chunks. Transfer to a bowl and gently toss with half of the olive oil and half of the vinegar. Season with salt and pepper and the garlic and oregano. Boil another pot of salted water. Add the beans and cook until tender. Drain and then place in an ice bath to cool. Drain well and add to the potatoes. 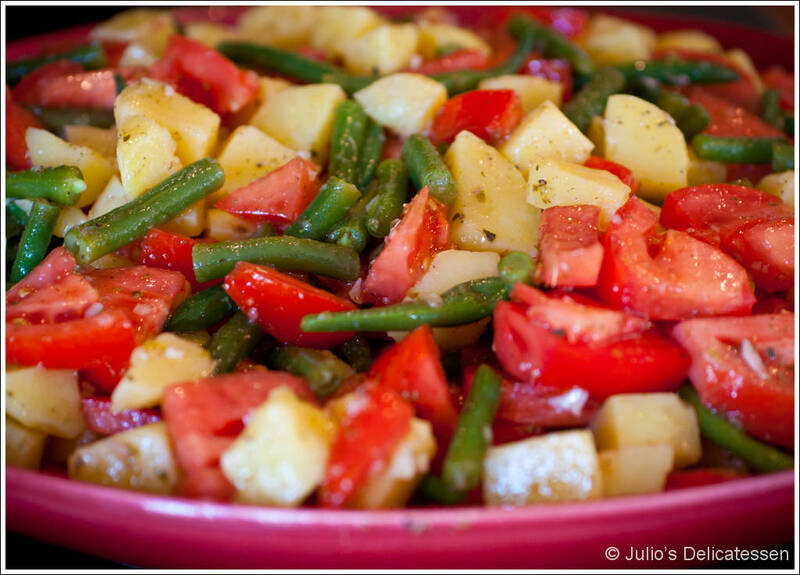 Cut the tomatoes into chunks and add to the potatoes and beans. Add the remaining oil and vinegar and gently toss to combine. Taste and adjust seasonings as necessary. Serve at room temperature. I just now stumbled upon your site. All I gotta say is an insane amount] of information. Perhaps you would be willing to swap backlinks?